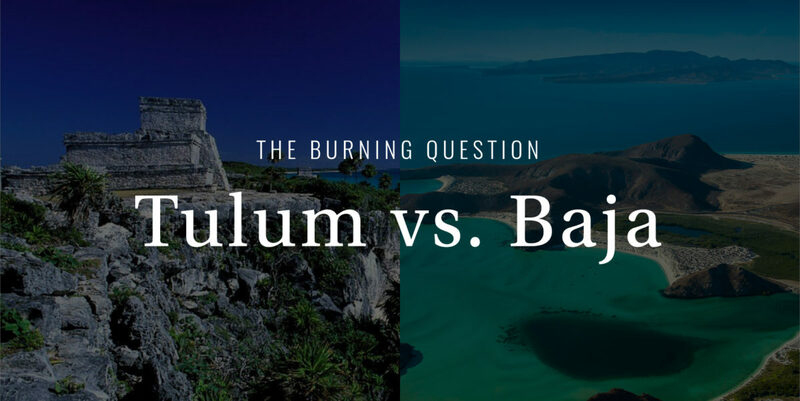 The Burning Question: Tulum or Baja? The call of Old Mexico is a siren song indeed—a song that every man, sooner or later, has no choice but to answer. Where else are the people so generous, the beers so cold, the cuisine so piquant, and the music so accordion-based? Where else can a previous-night’s hangover turn into a wonderful afternoon in the sun, with nothing more than a cold michelada and a bowl of pickled jalapenos so hot it simply burns the last of the tequila fumes away? Siestas, fiestas, and a culture as rich and vibrant as any in the world. No, it certainly ain’t no trip to Cleveland. As of late, Tulum has become a choice destination, and not without good reason: the Yucatan is reliably sunny and safe, the beaches and cenotes are stunning, and with a youthful and decidedly hip clientele, it has become something of the Williamsburg (Brooklyn, not Colonial) of Latin America; a place where the cold-pressed gluten free quinoa smoothies come with an ocean view and a kite-surfing instructor named Todd. Which is exactly why we’d rather go to Baja. And not the fancy resorts down at the tip, either. We’re talking the raw, gritty drive in from San Diego, past the bustling outskirts of Tijuana, and on to the blinding blues and brilliant golds of the Pacific. That burst of excitement when you cross the border, the smell of roasted corn mingling with the diesel fumes and the sound of norteño ballads—Mexico, at last. Sure, Tulum has its Full Moon Party, but you know what? F*ck that. Some Tigres del Norte on the juke and a glass of mescal is all an hombre needs. Upon driving into Rosarito just past Tijuana, you have the Rosarito Beach Hotel—sure, a little past its prime, and usually half-empty, but amid all that faded glory, you can hang out at the same bar where Frank Sinatra, John Wayne, and Kirk Douglas used to smoke Lucky Strikes and pound Carta Blancas. There’s a sign in Spanish above the entrance that says: “Through these doors have passed the most beautiful women in the world,” and with Marilyn Monroe and Rita Hayworth as former guests, it’s not a lie. When the sun goes down and floods the old Azteca Room with mango-colored light, you can all but taste the history. And as for food in Rosarito, Tacos el Yaqui mesquite-roasts its carne asada over an open pit, and serves it on tortillas with roasted peppers blackened to perfection. Then there’s El Nido, with its old Spanish gardens and cactus skeleton décor—the place specializes in Baja cuisine made from wild game, and if you’ve never tried quail eggs rancheros, venison machaca, and grilled pheasant with frijoles, this is your chance. Plus, there’s usually a big jug of tequila soaking in deer antlers, which is rumored to have a powerful, aphrodisiac effect. You know, just in case. Aside from the raw, wild highways between desert and sea, and the roadside taco stands that serve things you’ve never even heard of before, there’s always Puerto Nuevo. No, it’s not much to look at, but this run-down, scruffy little cliff town specializes in lobster. Specifically, fire-roasted lobster tails that you peel, tuck in a home-made tortilla with beans and melted butter, and eat with a cold beer at a table over the sea. That’s right: lobster tacos, Baja style. And no, there’s nothing else in the world quite like them. So if you want to enjoy craft beer and goat cheese & roast beet quesadillas with Todd, Tulum ain’t bad. Heck, it’s actually pretty fun. But if you want to slip a few pesitos in the juke box and work up the courage to ask your buddy Miguel if you can dance with his sister who’s home visiting for the weekend from Guadalajara, Baja is the place to do it. Who knows—she might even say yes. And lobster tacos on a cliff as the sun sets over the Pacific is not a bad first date.